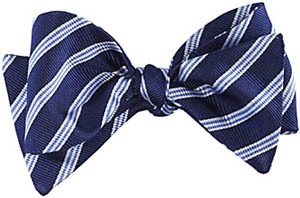 The BOW TIEis a type of necktie. It consists of a ribbon of fabric tied around the collar in a symmetrical manner such that the two opposite ends form loops. 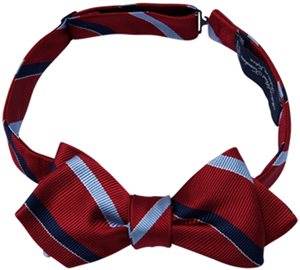 Ready-tied bow ties are available, in which the distinctive bow is sewn and a band goes around the neck and clips to secure. Some "clip-ons" dispense with the band altogether, instead clipping to the collar. The traditional bow tie, consisting of a strip of cloth which the wearer has to tie by hand, may be known as a "self-tie," "tie-it-yourself," or "freestyle" bow tie to distinguish it from these. 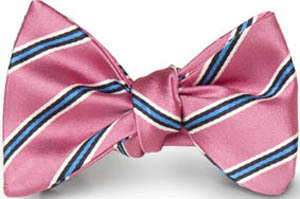 Bow ties may be made of any fabric material, but most are made from silk, polyester, cotton, or a mixture of fabrics. Some fabrics (e.g., wool) are much less common for bow ties than for ordinary four-in-hand neckties. 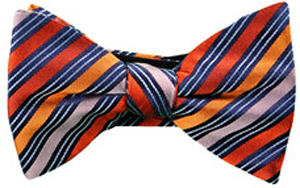 A modern bow tie is tied using a common shoelace knot. 3 Advanced Ways To Tie a Bow Tie - Gentleman's Gazette. How to Tie a Bow Tie - Ties.com. A.Quaranta Locatelli - "Original and unique collections of classical neapolitan tailored ties 100% silk, papillon and scarves silk and cashmere." ALLEN EDMONDS - since 1922. "An American Original." 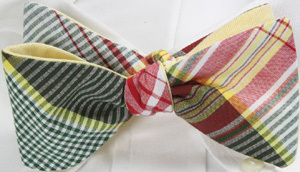 Andrew's Milano - "One of a Kind 100% Silk Handmade Self-Tie Bow Ties Be Bold. Be Original." 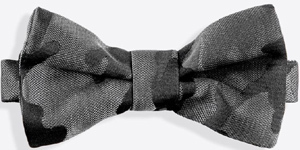 Blackpier - "Bow Ties and Accessories Online for Men." BRIONI - since 1945. 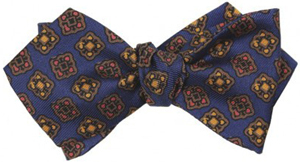 Men's designer silk bow ties. BROOKS BROTHERS - since 1818. CARROT & GIBBS - "The Definitive Bow." CHARLES TYRWHITT - since 1986. Jermyn Street, London. CHARVET - founded 1838. French high-end shirt maker and tailor located at 28 place Vendôme in Paris, France. Countess Mara - founded in 1935 by Lucilla Mara de Vescovi. DENMAN & GODDARD - since 1853. 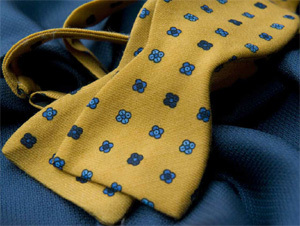 E. MARINELLA - Italian luxury bow ties since 1914. 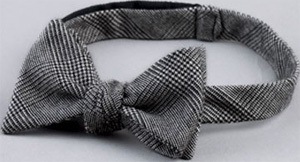 ETIES - "Designer bow ties online." Fiorio Milano - since 1946. 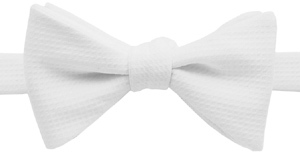 Flouzen Paris - cashmere bow ties. Gather & Hunt - black velvet bow tie. GIEVES & HAWKES - "No.1 Savile Row London." GITMAN BROS. - since 1978. Jupe by Jackie - men's & women's hand embroidered bow ties. Kamakura Shirts - since 1993. Lanieri - "Italians Do Fit Better." Choose the bowtie that suits your style and customise your look. Made in Italy. 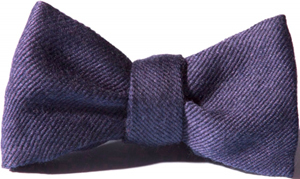 LANVIN - velvet bow tie. 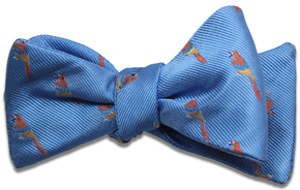 Le Noeud Papillon - silk & velvet bow ties. MIKOL - "The world's very first bow tie collection made with real marble stone." Mrs Bow Tie - "Handmade in England." Private Stock - since 1985. PURDEY - founded in 1814. RICHARD ANDERSON - 13 Savile Row, London, England, U.K.
Richard James - Savile Row, London, U.K.
Risley - 100% silk satin hand made bow ties. Made in Italy. Sailor Rose - "Made in USA." SerÀ Fine Silk - "Made in Italy for you." THOMAS PINK - since 1984. Jermyn Street, London, U.K.
T.M.LEWIN - established 1898. Jermyn Street, London, England, U.K.
TOM BROWN TAILORS - since 1784. Eton & London. TURNBULL & ASSER - "Made in England." 71-72 Jermyn Street. TYLER & TYLER - knitted bow ties.